Virasha STC is a venture of Virasha Infrastructure, it has been designed with a vision to enhance and facilitate business with all means necessary. E-8 Extn. Bawadiakala has been touted as the most blooming blossom of Bhopal's commercial orchard & now with Virasha STC, the upcoming area would witness a new chapter of fun & frolic. » Many residential developments nearby. » Major centers like M.P. nagar, New Market, Hoshangabad Road, Chunnabhatti Square are 5-10 mins. drive. » Modern architecture signifies glamorous ambience. » Dual basement parking and dedicated multiple lifts. » 100 % power backup in common areas. • Located in the most promising location. 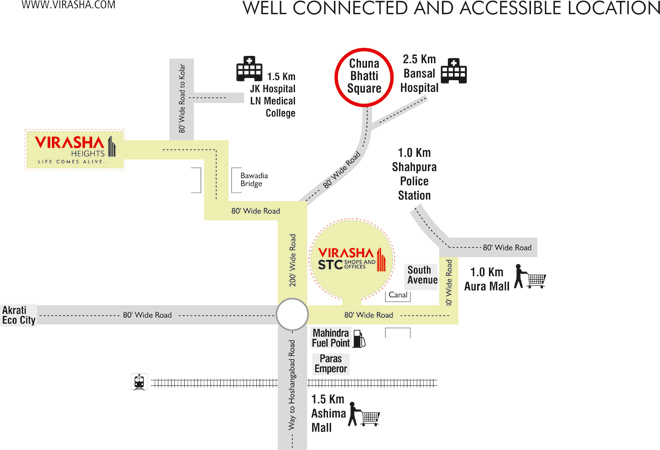 • Located on 80 feet wide bawadiakala main road in front of mahendra petrol pump.